Has clutter taken over your home? If you’re feeling stressed or overwhelmed by clutter it’s time to get rid of it. However, sometimes just looking at the clutter can make you feel anxious. It can feel like too much to tackle. Simplifying the process starts with simplifying your thoughts. The keep container will hold the items you want to keep, of course. These should be items that you use frequently. You might also keep items that have true sentimental value. An item shouldn’t be in the keep container unless you have a place to ‘keep’ it. The sell container will hold items that are in good shape and can be sold. You might host a garage sale or sell the items on eBay. The donate container holds items that are in good shape and can help others. These are the items that would take more time than they are worth to sell, but are definitely useable. The trash container is self explanatory. If you have a real problem with clutter, the trash container is often the fullest container. You might divide your trash pile into two other piles: recycle and garbage. 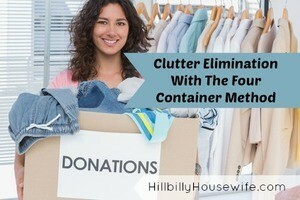 The best way to use the container clutter elimination method is to tackle one room or space at a time. For example, you might tackle a linen closet, or a bedroom. Choose the size of your container depending on the size of the job. For example, for a linen closet four laundry baskets might do the job. If you’re tackling a bedroom or family room you may need four tarps and some outdoor space. Empty the space completely. Examine each item in the space and make an immediate decision. Keep it, toss it, donate it or sell it. Don’t linger on the decision. Trust your instincts. And don’t keep everything. That defeats the purpose. Once you’ve gone through every item in the space you’re going to have four full containers. Hopefully, the keep container is the smallest. Take out the trash. Call the donation truck to come pick up your items. Take photos of the sell stuff or post an ad for a garage sale. And put everything away that you’re going to keep. Make sure each keep item has a good place to go. Consider labeling the spaces. For example, if you’re cleaning out your linen closet and you keep cleaning supplies in the closet, consider getting a basket to keep your supplies in. Label it so everyone knows that’s where the cleaning supplies go. Cleaning out clutter is easy when you use the container system. It helps you manage the clutter. It helps you get rid of the clutter. It helps you organize your home from top to bottom.